At the dawn of the new millennium, when marketing automation platforms (MAPs) were still in their infancy and inbound marketing techniques were still being perfected, B2B marketers – such as, yours truly, in conjunction with The Vanella Group, Inc. – were also pioneering ABM-based strategies and executing them at long sales cycles, high-tech companies. Targeting key accounts in coordination with sales, thoroughly researching those key accounts and then making human contact with key individuals at those accounts to identify their needs and align them with solutions that we had to offer – it all seems so yesterday, but we didn’t call it ABM back then. So what is ABM? HubSpot’s ABM “is essentially a form of strategic business marketing. An organization takes an individual prospect or customer account — these are companies, not individual people — and treats it like its very own market, or a market of one. It should seem ironical that both these MAP companies are calling for “personalized” or “market of one” strategies to achieve better marketing outcomes. The need for personalization in the B2B realm is related to that other catch phrase – human-to-human (H2H) – that has been generating a lot of cachet in the marketing world in the past few years, as the use of marketing automation programs become increasingly widespread in the B2B domain. But MAP-based ABM still seems to lack the critical H2H aspects when compared to the kind of account-based marketing offered by high-tech, sales enablement companies, such as the afore-mentioned The Vanella Group, Inc. Nonetheless, in her recently updated December 2016 blog post, “The Ultimate Guide to Account-Based Marketing: 6 Key Steps,” Amanda Zantal-Wiener pursues the personalization angle by noting that inbound marketing and ABM complement each other. She points out that while inbound marketing primarily focuses on creating great content to bring prospects to you, ABM puts the emphasis on individual prospects or existing accounts. So instead of creating content largely for broad audiences, the emphasis should also be on personalizing content for key accounts and using the right channels to promote it. Marketing automation does only what you tell it to do. Buyers are in control but Sellers must remain engaged and early engagement is key to success in closing the deal. Ownership, by someone akin to a program manager, of the customer engagement lifecycle is absolutely critical. Marketing and other functional groups must be aligned with Sales throughout the customer engagement lifecycle. Yes, if done right, ABM can be a significant way to boost your B2B’s revenue performance. But, it is important to mention that ABM is not meant to replace your B2B’s direct sales efforts – it’s intended to complement it. 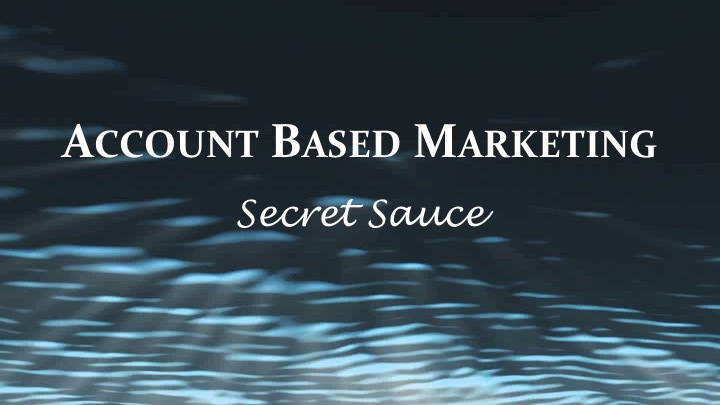 In fact, ABM needs to incorporate early sales engagement, including strategic H2H account contact at the right time(s) in the customer engagement cycle to ensure that any impending deals are making progress towards closure – this is the secret sauce behind successful account-based marketing!